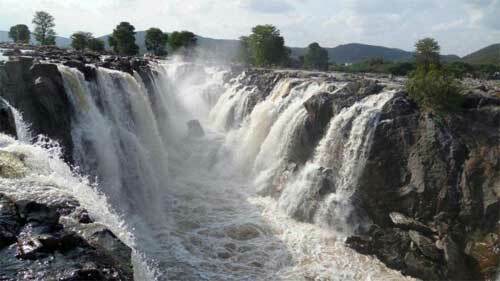 Tula Sankramana is of great importance at the origin of Kaveri River near Kodagu in Karnataka. Tula Sankramana 2019 date is October 18. Time is at 3:30 PM on Oct 18. Kaveri Tula Sankramana day is famous for Theerthodbhava. It is a unique annual spectacle that happens on the foothills of Brahmagiri Hills at Talakaveri in Coorg (Kodagu) in Karnataka. On the day holy water gushes from Brahmakundike, a small concave shape hole, on the Brahmagiri Hills at Talakaveri in Kodagu. Brahmakundike is the source of Kaveri River. Devotees can take holy dip in a pond that is located at Brahmakundike. The holy event also marks the beginning of the month long Kaveri Jatra. Thousands of devotees tonsure their head and take holy dip in the pond. As part of the Kaveri Jatra, people perform holy dip at Triveni Sangama, confluence of the three rivers — Cauvery, Kannike and Sujyoti — and offer prayers at the Bhagandeshwara temple. Talacauvery is located around 8 km from Bhagamandala town. On the day special prayers and pujas are offered to coconut or cucumber wrapped in a red silk cloth in regions directly benefiting from the might Kaveri River. The coconut and cucumber symbolizes Goddess Kaveri. Goddess Kaveri is adorned with jewels and flowers on the day. The jewelry offered is pathak or mangalsutra and puja is known as Kanni Puja. The offering to the goddess include areca nut, betel leaves and glass bangles. Prayers are offered by throwing uncooked rice on the coconut or cucumber draped in red cloth.